Brochures, leaflets, marketing material, website, customer / supplier/ employee / shareholder communication, legal notices, agreements, reports etc. We are doing most of these. TranslationPanacea is the end-to-end translation service for books into Indian regional languages and other languages for both ways translation. The world becoming one village, the flavour of local languages and culture brings interesting diversity to life. Yet, language cannot be a bar in human communication. Effective translation trasfers the information, knowledge, feelings, emotion and culture from one language to another language. Not only classical literatuer and fictions, but informative books, reportage, travelogues, books relating to self help, management, science, psychology...so much is being written and language need not be a barrier between knowledge, thoughts and people. In recent times the trend is even more visible. Both Indian authors’ and western authors’ works are in great demand. If ‘Geetanjali’ had not been translated in Indian languages; we would have been deprived of the aura of our own diamond. We review the book for translation and give our feedback on its probable acceptance in the target language readership, culture and sensibilities. – A very valuable input before making an investment. It is very useful for authors, publishers and distributors alike. • Bringing out a publication in a foreign land is a crucial decision, be it a book line or a periodical. It requires an insight of the sensibilities of the reader population, size of the market, reading habits and gap in the supply. The decision has the dimensions like time, quantity and location. Trial and error can be quite expensive, not in terms of money, but also otherwise. • When a book review is done with the specific target in mind, it gives you insight of all parameters of concern. • When a third party does the book review, there is no bias or interest, but only passive and information based analytical view, which enables the publisher take a informed decision. • We both agree on the terms. We send the invoice in soft copy to you and you transfer funds electronically. • We may need some more information from you, we send you a small questionnaire to you for your response. • We review the book, send to you for your perusal. • Once you ok it, we will flash it on all major online booksellers, selective blogs and website and social media pages of TranslationPanacea. What do you get with book review? • About 300 words candid and critical review. • Posting of review on major online booksellers. • Inclusion of the book in our website list. Everyone has to take help of language when it comes to expressing your best product, service, instruction, policy, promotional scheme... anything. We write crisp, concise, correct and catchy contents. Language no bar! It is a complete end-to-end service in translation. 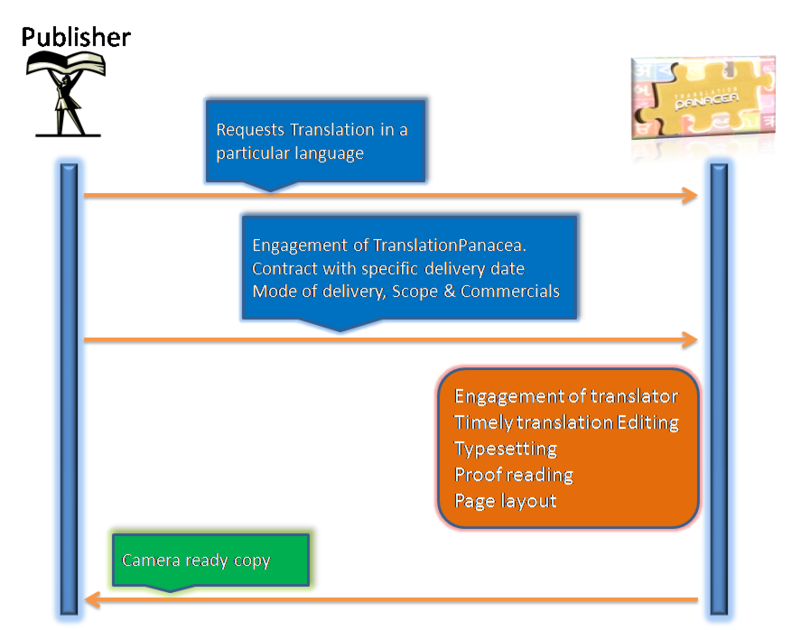 It starts with indentifying the correct translator depending on the subject of the book and the language pair. It includes translation, editing, typesetting, proof reading, page layout and handover of the camera-ready-copy to the publisher. At a single point and for various languages! Publishers are delighted to have this end-to-end service. Be it a youtube video, a documentary, a presentation or a feature film, to let the viewer understand better, subtitles help a great deal. We bring the essence of the original written or spoken words in the subtitles, so that the viewer is not distracted from the original work, but appreciates it better. Foreign and Indian publishers alike are keen to take their work to readers from other parts of the World. They engage us to find a counterpart in the target country and to take the deal ahead. We are very transparent in the whole process and strive to strike the win-win deal. For example, a US publisher of children’s books may want to reprint and distribute their titles as well as have their translations published in various Indian languages. They engage us with specific requirements and targets. We then talk to potential Indian counterparts, check the capabilities and select on the basis of pre-determined parameters and take the deal ahead. • The seller and the buyer do not have to go through the tedious process of identifying the suitable counterpart. • The third party advantage. The seller and / or the buyer can keep their identity undisclosed till the step they wish. • TranslationPanacea is in touch with publishing houses of various sizes and interests and expertise. This makes the choice easy and mutually beneficial. • The seller and the buyer benefit from the network and the acquired knowledge of TranslationPanacea. Especially for Indian languages, this is a very important but not-so-nurtured area. We will take up the task of keeping the metadata update on publisher’s website to enable better online presence and better online sale.